Last weekend I decided to take a trip to the Ballard farmer’s market – as a newbie to the city of Seattle and person who generally likes food, I’d heard this was a must-do. So I was excited to wander over on Sunday, empty-basket in hand, as the sun peeked out from behind the drizzle. I’m here to report that the outing was, indeed, a must-do. Yes, the produce and flowers and prepared food are fantastic (salmon sliders, hello). 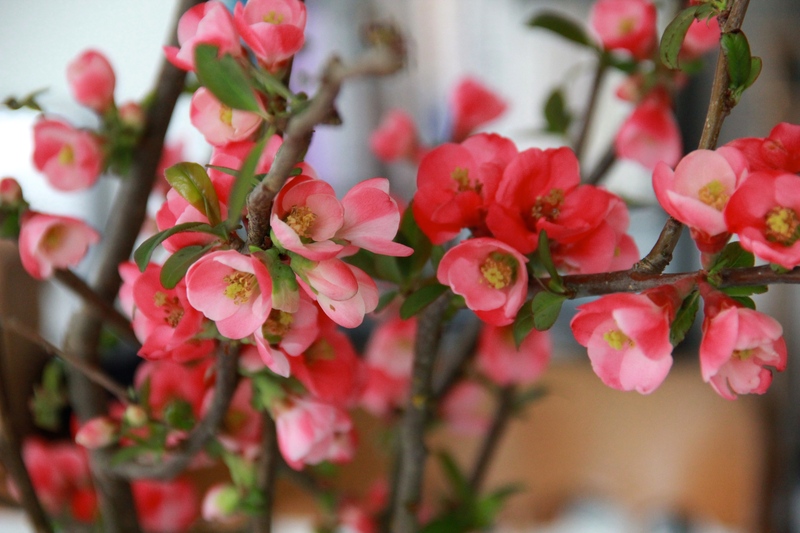 Yes, I did get my hands on a huge arrangement of gorgeous flowering quince branches. I bought freshly canned tuna, a handful of sunchokes (more on those later) and some broccoli rabe, a big bag of arugula, a gigantic leek and bunch of firm, bright pink stalks of rhubarb. It was awesome. But! But. I had just bought my beautiful branches and was sidling over to the honey booth when — HEY! I know that little girl. How do I know that girl? She’s all cheeks and dark brown curls. She’s dancing (adorably) in front of the bluegrass trio by the curb. How do I know her?? OH RIGHT, I stalk her mom on instagram! Yes, correct. The little girl was baby June, daughter of Molly Wizenberg (she of Orangette), who was also standing right there. At the market. Next to her husband (who runs one of Seattle’s best restaurants and bars). Next to me. um… HI MOLLY! Thanks for being an amazing writer and cook and inspiration to me, in general. Also your daughter is the cutest and your husband makes great pizza. …Hi. I actually didn’t say hi, since they seemed to be enjoying some family time, and also because I wasn’t sure what I would say (the above seemed a bit over the top, at the time). I mainly just smiled from behind my giant branches and hoped no one would call me out as a creeper (holy smokes I’m such a creeper). Then I bought some granola from Megan Gordon (of Marge Granola and an amazing, newly released cookbook) and my life was pretty much complete. Ballard farmer’s market, you rule. As for the rhubarb I bought at the market? I knew only a recipe from Orangette would do. This one is the simplest as they come, and turns sour, tart stalks of rhubarb into sweet, tender, spoonable fruit. We ate it warm, spooned over bowls of ice cream, which I think is the way to go, though the other Molly swears by eating it straight from the refrigerator. 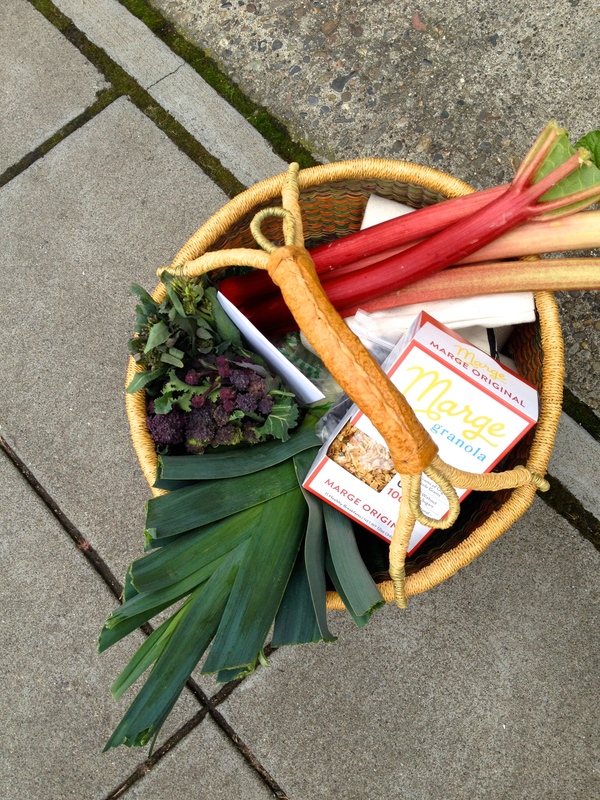 Arrange the rhubarb in a deep pie or tart tin (or in a medium Dutch-oven). Scatter the sugar over the fruit evenly, and drizzle the wine and vanilla extract on top. (If using a vanilla bean, stir it all together to distribute the seeds). 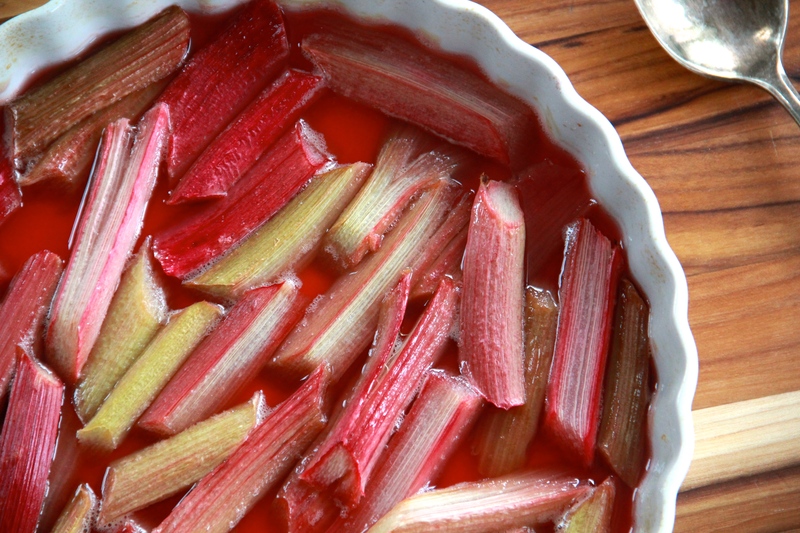 Bake the rhubarb, uncovered, for 30-45 minutes, until tender and juicy. The warm rhubarb can be scooped over bowls of vanilla ice cream, or set to cool and eaten (with some yogurt or straight-up) directly from the fridge. Ha! You crack me up, Molly! Next time, please, please, please say hello. And welcome to town! P.S. 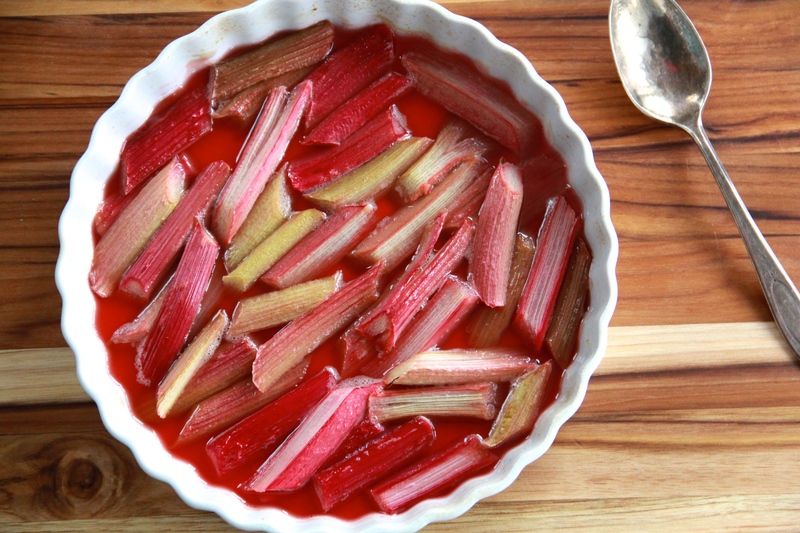 Your roasted rhubarb is GORGEOUS. PERFECT SUNDAY. Seattle is welcoming you with open arms.